GJMM Youth Wing Gorkha Jan Mukti Yuwa Morcha today took out a rally in support of Demonetization decision of BJP Government. Today many supporter from GJYM came on the roads to lend their support to their Allies partner. The rally started from Damber Chowk with Slogans of Jai Modi , Jai Bimal ' Gorkhas do not support Corruption etc. The rally which encircled the whole town area turned into a Path Sabha after reaching Damber Chowk. Addressing the meeting Anil Lopchan Vice president central committee of GJYM taunting towards TMC party recent rally said we are not affected at all with the decision but those affected took out a rally against the decision.Replying to Binny Sharma allegation that GJMM leaders have the Black Money he said TMC must give the answer weather GJMM minister went to Jail or TMC minister in the Sardha Chit Fund case. GJMM will not support the 28 Nov All India Strike as all GTA region will remain opened informed Anil Lopchan. 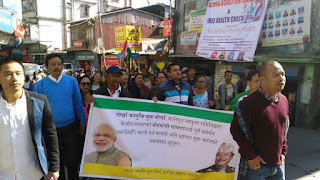 The rally was addressed by Prabhat Ghising, Bal Krisha Thapa. After the meeting the leaders welcomed the student union of Cluny Women’s College who won the election uncontested. 0 Respones to "Gorkha Jan Mukti Yuwa Morcha rally in support of Demonetization"